As some of you know, I was a National Geographic Glimpse Correspondent in the Spring of 2009. For those who are also interested in this opportunity, the application to be a Fall 2010 correspondent goes live today and the final deadline to apply is June 15. -You must be between the ages of 18-34 to apply. -You must be living abroad for at least 10 weeks during the fall. -To apply, you will need a writing sample and samples of your photography. (I think I improved my photography as much as my writing during my time as a correspondent). As a correspondent, you'll write a feature story, a how-to guide, create insider tips, a slideshow, and keep a blog on the glimpse.org website. Like many publications, they no longer have a magazine, all is online. For a sample of what I wrote for them, see my piece on How to Speak Swiss. If anyone has a question about the program, feel free to contact me or leave comment. I'm happy to do another post on this if there's interest. This sounds like a really interesting program. It would be great to have such constructive feedback from National Geographic editors. 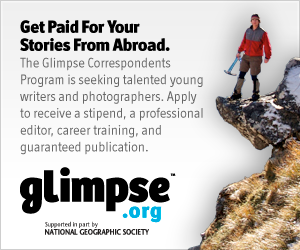 Were you able to keep up with your own blogging and writing during your time as a correspondent, or was the program so rigorous that you were mainly writing for Glimpse? I wish I was living abroad so I could so this! It sounds awesome. It was a lot of work, but I was able to keep up with everything else including a day job. Good luck! I wish I could do this! We've been talking about moving to England this fall, but plans aren't set so I don't want to apply in case we don't move. What a neat program though! Maybe next year! Note to all: the National Geographic Glimpse program is changing (it won't be sponsored by NG any more) and the editors I worked with are leaving. This was just announced. The Matador Travel Network will be running the program in the future. I don't know how this will change things but will try to update when I know more. One more addition: I've been asked by a few readers what kind of writing sample the editors are looking for. Note that the editors of the program are changing, but the essay I submitted to the program that landed me the position for 2009 is linked to on the sidebar of this blog under "Essays about life abroad". It's "The American at Swiss Gardening Boot Camp" piece. My friend was once a top Air terimaksih info you preach this. greetings from us by obat kuat pria. with email address, or cannot sign in, please go to gmail email login to find the solutions. Great blog.I really appreciate this blog. Thanks for sharing. Essayassignmenthelp provide best online Essay Help services at affordable cost. Fantastic one of the best subject material to the current web-site! Now we have every last endure. This is a detail that might for your awesome plus looking. Any one might please click here Cash Advance Excellent details listed below continue on. RPG Maker MV Torrent was born to fulfill the desire of creating an original RPG without programming knowledge.RPG MAKER can create RPGs for MacOSX, Android and iPhone! Ashampoo Burning Studio 18.0.8 makes sure that burning data, creating backups or copying discs has never been so easy to achieve. net the simplest factor to take into account of. The Antivirus Package protects one device and works on IOS, Windows, Android, and MAC. It includes real-time protection, virus, spyware, Malware and phishing protection. how can create a wordpress blog. Pharma franchise business is one of the fastest growing online B2B pharmaceuticals portals in India where you will find the list of top pharma franchise, pcd pharma franchise and third party pharma manufacturing companies in India. Tinnitus 911 is made with intense and regular fixings. It's reasonable for the two people to use with expectations of mitigating the manifestations and conceivable striking at the center of the issue. Thanks for the data, perhaps I will use this over my tufted selling and i have been use much annulus Mainedia in run a interaction and that they somebody existing a giant amend on me. Our virtual intelligence web development company has certified web development professionals who understand the value of prestigious architecture and integrated branding to attract the customer and keep them engaged from the initial sight of your website. Our Web development services will facilitate your company to increase product knowledge.We have a team of full-stack Android app developers for excellent APP Development, having a robust command on PHP, Java, C, C++, HTML, and CSS to develop high-end Android apps for smartphones, tablets, wearable devices, and Android TVs. Our team of Android programmers develops an app for almost all the categories of Google Play Store, including Photo & Video, Health & Fitness, Education & Learning, Real Estate, Travel & Tourism and E-commerce. We offer the entire managing service for client interaction with the assorted stakeholders. Which provides the Best Seo services, website designing services. Virtual Intelligence is one of the growing & emerging app development company in Noida. We provide ultimate IT & Marketing solutions, Web designing, APP Development, Digital Marketing Solutions, CRM, Training Management, Leads generation, Software Development & PR Management. Our web designing expert follows the most recent techniques whereas creating the most effective efforts across the globe. You will get Perfect Software Development & Digital Marketing Solution For Your Business. Best Training Company in Noida. Should you take a Mediabistro class?